Again, he entered the synagogue, and a man was there with a withered hand. And they watched Jesus, to see whether he would heal him on the Sabbath, so that they might accuse him. And he said to the man with the withered hand, “Come here.” And he said to them, “Is it lawful on the Sabbath to do good or to do harm, to save life or to kill?” But they were silent. And he looked around at them with anger, grieved at their hardness of heart, and said to the man, “Stretch out your hand.” He stretched it out, and his hand was restored. The Pharisees went out and immediately held counsel with the Herodians against him, how to destroy him. Do you still remember what we reflected on the last Sunday? That was the Holy Trinity Sunday, and we reflected on how the Triune God comes to us and reveals Himself to us right here in the Divine Service. That’s why we call it the Divine Service, for this is not about what we do for God, it is about what the Triune God does for us. Remember how we looked that it is here where He makes Himself known as loving and gracious God. How do we begin the service? Yes, in His name. In the name of the Father and the Son and the Holy Spirit. That is, by His command and acknowledging that He Himself invites us and is present among us. What comes next? The confession and absolution. Who convicts us of our sins? The Holy Spirit. Who do we pray for forgiveness? The Father. Why does He forgive? Because of His Son. Who assures us of God’s forgiveness? The Holy Spirit does. The whole Trinity at work. Then the Triune God speaks to us through pastors, and as He speaks He also sends to us His … yes, His Spirit, to shape our hearts and our minds. And then the Father invites us to the Holy Meal of His Son. And as you receive the body and blood in the Sacrament, you are united with Jesus, the Son of God, and the Holy Spirit indwells in you. And where there these two are present, there is forgiveness and eternal life. Thanks be to God! This is how blessed we are. We can know our God, we can enjoy His grace and hospitality, and we do well if we, indeed, appreciate these priceless gifts and receive them as often as we can. But there is a problem. The problem is … us. That’s right. We may have been given the most precious gifts of God, but we tend to do something wrong with them. How and why? It is actually very simple. And the second one, – Jesus was in the synagogue. There was a man who needed a healing. Jesus even asked if that was lawful to heal someone on the Sabbath. He knew what the Pharisees would answer. It is interesting to picture what Jesus did. He knew that according to the Sabbath laws it was not lawful to do any work on Sabbath, and healing was listed among those works. So, Jesus did something that drove His religious police crazy. He didn’t do any healing. Instead He simply said: “Stretch out your hand!” The man stretched it out and his hand was healed. No one could object to what Jesus had done, as He hadn’t done any healing. At the same time, He had healed the man. Everyone saw it. Imagine how angry must the Pharisees be… Jesus had humiliated them publicly, and formally there was nothing to object to. As we can read, they were in rage and went to conspire with people with whom they wouldn’t otherwise associate. We may wonder what was wrong with them? And how can this help us to see what is wrong with us? What was the reason for these confrontations? 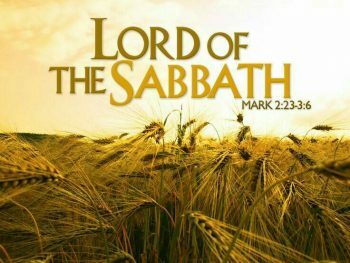 The observance of the Sabbath. What was the Sabbath? When God Yahweh restored Israel’s freedom, rescuing them from slavery, He also instructed them how to enjoy this freedom. As a part of this instruction He gave them the gift of the Sabbath day. The day of rest. It was a day of rest in two senses. It was a time for physical rest and, also, and even more importantly, it was a time to be spent in fellowship with God. Thus, God Yahweh gave the gift of Sabbath and commanded to use it. What had happened with this gift? As time went people had turned this gift into their own good works. To keep the Sabbath wasn’t so much about resting in the fellowship with God, it was about keeping the Sabbath as carefully as possible. They had lost the purpose of the Sabbath Day. This explains why the Pharisees attacked Jesus. For them keeping the Sabbath wasn’t about receiving the gift of gracious God, it was about diligently keeping all the rules and regulation they had invented. Can you see where this is going? The last time we spoke about the importance of the Divine Service. We often speak about the importance of the holy day, when our Father invites us in His presence to be with us and to bless us. These are wonderful gifts, priceless gifts, great treasures. However, we can easily make them into our good works. Instead of receiving these gifts with gratitude, we can easily start worshipping the gifts. We can start worshiping Sundays. We can start worshipping the Divine Service, or the right liturgy, or the wrong liturgy at that. Then we could start thinking, if only I don’t do anything on Sunday, God must be pleased with me. If only I attend the service on Sunday, then I am good, I have done what God expects. If only we have that liturgy that I think is the right one, then we will be saved. We can make every wonderful gift into an idol. The reality is, that we often do. And this is nothing new. It happened in Jesus’ time, it happened in the age of the Reformation, and it is happening today. Luther had some great things to say on this topic. I’ll read a few quotes from the Large Catechism. This should sound familiar and close to your heart. “What God requires in this commandment? First, for bodily necessities, that for a day we may retire to rest and be refreshed. Secondly, and most especially, that on such day time be taken to attend divine service, so that we come together to hear God’s Word, and then to praise God, to sing and pray. However, this is not so restricted to any specific day … for in itself no one day is better than another; but this [hearing the Word] should indeed be done daily… But since from of old Sunday has been appointed for this purpose, we also should continue the same, so that everything be done in harmonious order. Therefore, this is the simple meaning of the commandment: [such day] should be devoted to hearing God’s Word… that we occupy ourselves with God’s Word and exercise ourselves therein. For God’s Word is the treasure which sanctifies everything… Whenever God’s Word is taught, preached, heard, read or meditated upon, there the person, day, and work are sanctified. Not because of the external work, but because of the Word, which makes saints of us all. And, on the contrary, any observance or work that is practised without God’s Word is unholy before God, no matter how brilliantly it may shine. Since so much depends upon God’s Word that without it no holy day can be sanctified, we must know that God insists upon a strict observance of this commandment and will punish all who despise His Word and are not willing to hear and learn it, especially at the time appointed for the purpose. Therefore, not only those sin against this commandment who misuse and desecrate the holy day… [by ignoring and despising God’s command] but also that other crowd, who listen to God’s Word as to any other trifle, and only from custom come to preaching, and go away again, and at the end of the year know as little of it as at the beginning. It is so refreshing to hear these words from our own Martin Luther. When we had our workshop two weeks ago, it was like a music to hear that many of small groups emphasised that we need to be more deliberate about dwelling in the Word. Learning, discussing, preparing to share it with others. Bishop Stephen too reminded us, as he did to the Synod a month ago, that unless we remain in Jesus, by remaining in the Word and Sacrament, we can do nothing. We can’t bear fruit. This may seem a small thing, to remain in the Word, but it is the foundation of everything. The principle is simple. We can only give what we have received. If we are serious about sharing with people the hope of eternal life that is found in Jesus, we need to take in as much as possible, so that we could give, speak and share as much as possible. I am here to help. To help you to understand, to help you to learn, to help you to find words how to engage with your neighbours. So, please, use me, this is, why the Lord has sent me here. Your pastor is the Father’s gift to you. Sure, this gift may not be exactly what you were hoping for, but the Giver of the gift can still bring you many blessings using even imperfect tools. Concluding a little more from Luther’s Large Catechism. Something to help us to rejoice in the gifts that our Lord still gives us. “For let me tell you this, even though you know it [the Word of God] perfectly and be already master in all things, still you are daily in the dominion of the devil, who ceases neither day nor night to kindle in your heart unbelief and wicked thoughts against the foregoing and all the commandments. Therefore, you must always have God’s Word in your heart, upon your lips, and in your ears. But where the heart is idle, and the Word does not sound, he [the devil] breaks in and has done the damage before we are aware. On the other hand, such is the efficacy of the Word, whenever it is seriously contemplated, heard, and used, that it is bound never to be without fruit, but always awakens new understanding, pleasure, and devoutness, and produces a pure heart and pure thoughts.” And many of you have experienced these blessings of the Gospel. When we exercise in the Word, the Spirit brings us joy. Brothers and sisters, we have been so blessed. We still have all these great tressures given to us. The day of rest. The Divine Service. The Word of God and opportunities to freely read, study and meditate upon it. Many can only dream about what we already have. I pray that our gracious Father doesn’t let us to become Pharisees but help us gladly to receive and enjoy these gifts, for that’s how our Lord makes us a blessing to others and builds His Church, and that’s how He brings us safely into His Kingdom of everlasting peace and joy.